Additionally, we thought that if Triple Town failed to make traction on Facebook for whatever the reason, it wouldn’t be hard to reskin and release the game on Flash portals. Those platforms have historically been our bread and butter, and we generally feel more comfortable with a project if we think it can eventually find a home in the Flash portal ecosystem. Of course, the game needed a revenue model. Fortunately, Triple Town is an extremely deep puzzle game once you really wrap your head around it. An expert player can stretch a single game out for hundreds of turns… and that depth creates plenty of opportunities to sell virtual items that might appeal to players. Play the game for a while and you’ll discover how surprisingly tempting it is to purchase that final tree you desperately need to complete your magnificent plans… plans that you’ve been working towards for the past 100 turns! But, as with most good f2p games, we don’t force you to buy the tree and many skilled players will probably learn how to succeed without doing so in 98% of situations… and in the other 2% of situations, they’ll have earned enough virtual currency to buy what they need for free. Is it possible we’re leaving money on the table? Yes. But we’d rather err on the side of leaving money on the table, rather than send a message that this game is for paying customers only. We also decided to experiment with limiting the number of turns a player can take for free during any given time period. This is something that most social games do (i.e. limited energy in CityVille, for example) but most puzzles games on Facebook do not do this. It might work for Triple Town; it might not. We’ll find out during the beta. The questions for us are first and foremost: does limiting free play hurt retention? If so, is the revenue generated from selling more turns enough to outweight the downsides? Once we have the answers to those questions, we’ll re-evaluate our design. I look forward to telling you more about our plans for Triple Town in the weeks to come. We intend to build a whole world around this concept; the current incarnation of the game is just the first step towards that goal. While we work our way towards that grand vision, please do check out the current build and let me know what you think! Nice work! The new graphics and animations are smooth and charming. 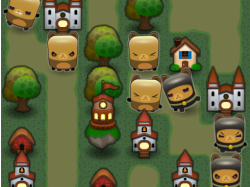 I’ve started playing triple town yesterday. Loving it at the moment. I suddenly remembered yesterday that I hadn’t tried out Triple Town yet (I’d been wanting to for some time, but wasn’t able to since I don’t own a Kindle). It’s definitely an engaging title. On the game design side of things, I felt like either an explanation of how the next given tile was determined would be nice if it’s mostly non-random, or else if it’s mostly random a ‘preview’ (ala Tetris) would be appreciated. If I understand the turn/coin system correctly, then I greatly prefer it over “energy” both from a player’s standpoint and from a design standpoint. My understanding is that, once you run out of turns, you can start a new town, with both coins and turns refreshed. It’s only if you want to keep playing the current town that you’d need to buy more turns in the store, right? I think that’s a great compromise between free and pay-to-play. It would be nice to have the option to start over before running out of turns, but then you’re probably planning to add that into the menu soon. Oh! I play Triple Town in Facebook and in G+and I love it but it’s so annoying to wait when I run out of turns! You should make it faster or give more coins when you finish a town! If you improve that I would probably keep on playing.